Given that the embarrassment of Lyft's post-IPO belly flop is still fresh, the notion that Wall Street analysts are approaching Uber's upcoming $100 billion debut with anything other than trepidation is simply baffling to us. Didn't Uber just admit in its S-1 that there's a real possibility that it might never achieve profitability? And though Uber is, we supposed, the ride-share "market leader" (in both market share AND operating losses), the notion that the supposed 'professionals' aren't at least a little bit skeptical of the valuation that Uber and its bankers are pushing shouldn't be surprising. However, for the editors at CNBC.com - who we imagine risk the dreaded "tap on the shoulder" should they publish a story that's not at least implicitly bullish - framing the company's coverage of the Uber IPO must have presented a particularly difficult problem, requiring them to tread carefully lest they violate the company's reporting mandate. It's difficult to imagine another reason why the following headline - "Analysts don’t know what to make of Uber’s $100 billion valuation" - managed to make it out. Are analysts, who get paid millions of dollars a year to pick apart company's valuations, parsing every conceivable metric, simply too conflicted to make a call on the Uber IPO? From what we can tell, the answer is no. Because even in an industry where analysts' opinions are occasionally influenced by the business considerations of their employer, several analysts have urged anybody thinking about buying at the IPO to think carefully about their decision before they buy. One analyst, who was quoted by CNBC, argued that if you ignore the hype and simply evaluate Uber on its numbers, the picture isn't so rosy. Valuing the company at six times sales - a generous valuation, even for an established tech firm - Uber would be worth $73 billion. That would mean a $100 billion valuation is roughly 40% above fair value. And given the market's response to the Lyft IPO, this might be a fair assessment. Wireless Fund Lead Portfolio Manager Paul Meeks said the best way to understand the valuation is through its sales numbers. Pricing the stock at six-times sales, which he said would be "a pretty healthy valuation even for an established tech company," Uber’s value should really be about $73 billion. Similarly, he estimated Lyft should be priced at $50 per share with a valuation of $14 billion. Right now, Uber is going public at a time when its losses continue to grow, and the company has no clear path to profitability. And though its high valuation is largely driven by what Wedbush Securities analyst Dan Ives, widely regarded for his analysis of Apple, loosely describes as 'Amazon-inspired FOMO' - that is, the fear that investors might be missing out on the next Amazon, which also posted operating losses for years before finally becoming profitable - comparing Uber to Amazon is pretty tenuous. "That path to profitability is fuzzy. And also comparing Uber to Amazon, it’s like comparing a great high school basketball player to LeBron James," Ives said. "They’ll try to leverage their platform into other things, but the other things will be transport because that’s their gig and the transport business has a lot of established players," Meeks said. Eventually, he said, "all freight will be transported by Amazon." 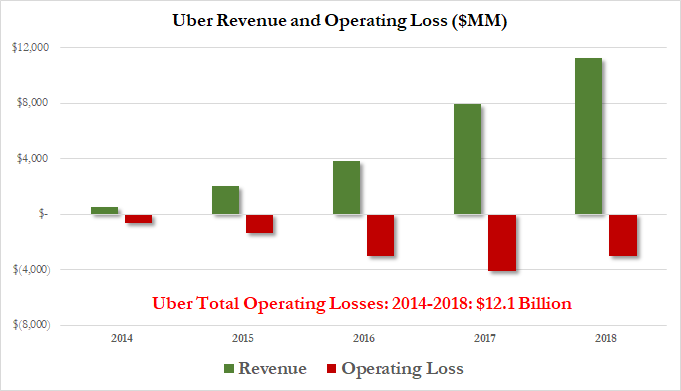 To be sure, Uber's adjusted losses briefly improved during the first three quarters of last year, Uber's disastrous fourth quarter mitigated any prior improvements (and as we pointed out, they it made $1 billion last year on paper, that profit was driven by the divestiture of its Southeast Asia business). Whether Uber soars or flops during its trading debut remains to be seen. And there are certainly analysts out there who would tell you that the company is a solid buy. But based on the contents of this CNBC article, maybe a better headline would be something like: "Analysts have serious doubts about Uber's $100 billion valuation".